LFH Luftverkehr Friesland Harle was engaged in scheduled operations between Pärnu and Ruhnu Airport in Estonia, using BN-2 Islander aircraft. The flight that had been initially planned for 26th February 2007, was postponed several times due to adverse meteorological conditions, causing problems with provision supply on Ruhnu island. On Friday, 3rd March, pilot checked the weather at 15:00 and at 16:00. Based on the received information the pilot decided to depart for Ruhnu at 16:00. At 16:08, the aircraft took off from Pärnu airport with a pilot, two passengers and 520 kg of cargo on board. According to the weather briefing received by the pilot via telephone from Kuressaare, at 16:00 the cloud height in Kuressaare (EEKE, 36 Nm northwest of Ruhnu) was 600 ft. and 180 m (approximately 540 ft.) in Ruhnu. During the uneventful flight on the altitude 1500 ft., the coast and the ice border were clearly visible. The aircraft stayed clear from the clouds and no signs of icing were noticed by persons on board. Approaching the island from the northeast it was intended by the pilot to use runway 32 for landing. The pilot decided to fly low from east to west across the runway to check the windsock and runway condition. While approaching the island, the pilot descended at the rate of 150 ft/min with low power settings and flaps extended by 1 notch. During descent the horizontal and vertical visibility deteriorated and the flight was continued in IMC. The descent was continued in clouds; therefore the pilot had no visual contact with the ground and horizon. The aircraft broke through the clouds over the coast at a very low altitude (100-120 feet). 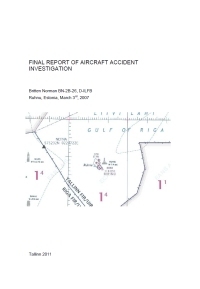 Trying to maintain safe altitude and speed pilot added power, at the same time stall warning signal activated and seconds later the lower part of aircraft's fuselage touched the treetops and collided with the terrain at 16:36. The passengers and pilot escaped the aircraft without assistance and with no injuries. 1. The pilot could not maintain safe flight altitude when approaching Ruhnu aerodrome. 2. The pilot continued the descent in spite of IMC. 1. High motivation to perform the flight. 2. Inadequate weather information from ground services of Ruhnu aerodrome. 3. Inadequate aeronautical oversight in the destination airport. Civil Aviation Administration should find possibilities to ensure more efficient control over scheduled flights performed to and from the aerodromes with no qualified personnel on site. Civil Aviation Administration should consider reviewing the minimum requirements for the small airfields serving regular commercial flights. This should take into account both personnel training and meteorological equipment. Distance from Pärnu Airport to Ruhnu Airport as the crow flies is 99 km (62 miles).